Well there goes another year…. 2018 is rapidly coming to a close, taking with it, the highs and lows of the year. We always hope to build off the high points and learn from the low points. Some of the highs for the year include a year that has been full of travel to various conventions, all across the country. 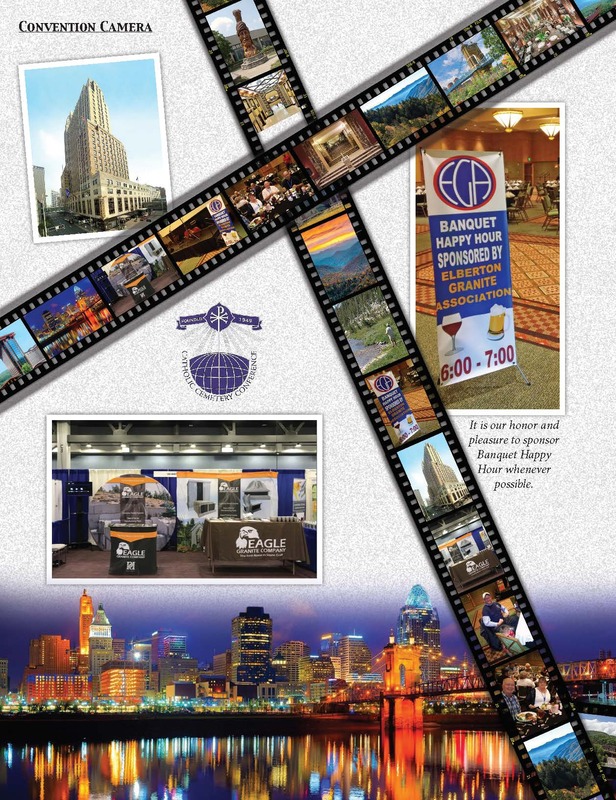 We always enjoy traveling to all the various conventions, building new relationships and updating relationships that have existed for many years. 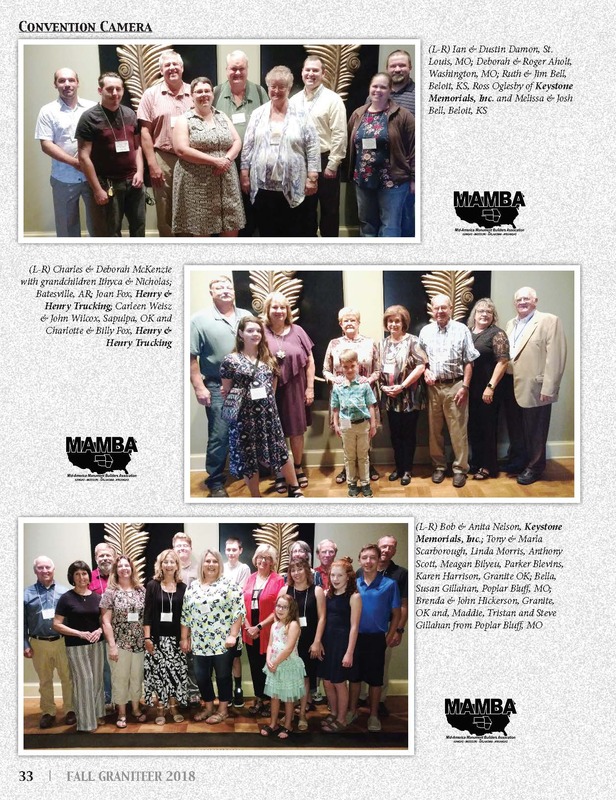 We had the opportunity to host several different groups in Elberton in 2018. The School of Hard Rocks was back for another year as was the EGA’s Basic Monument Retailers Course. 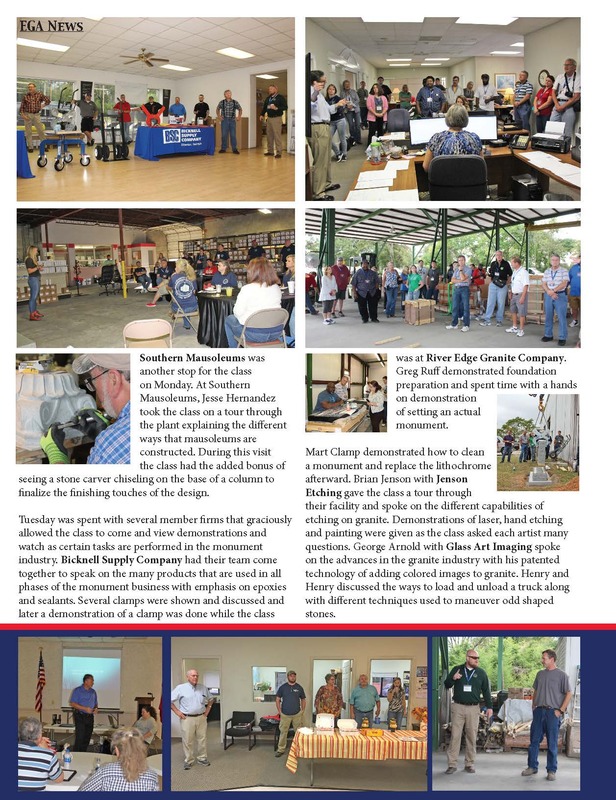 Each year, these groups bring the best and brightest to Elberton to learn how better to work with granite. 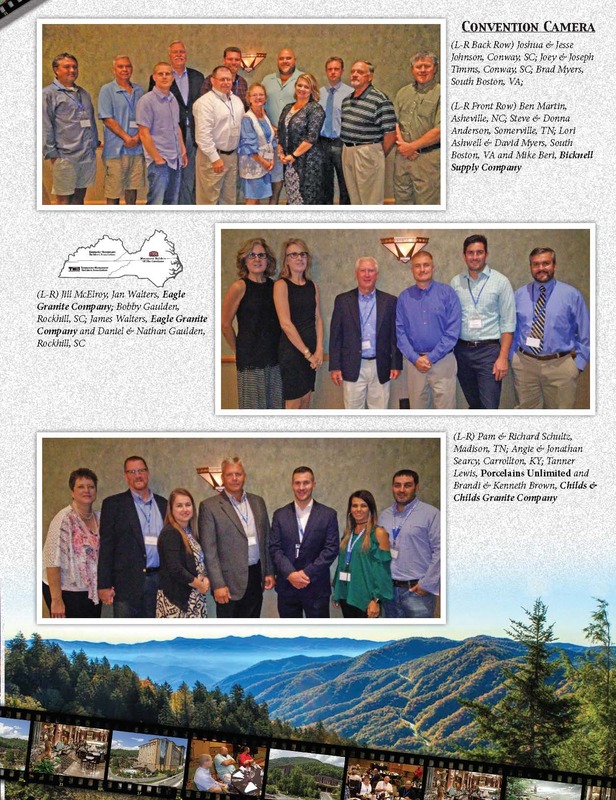 We also hosted the Allied Stone Industry tour and the North Carolina Monument Retailers tour, each which brought retailers from around the country to see Elberton and the product we manufacture. There were thousands of visitors that came to the museum, learning about the history of the granite industry in Elberton. As well, the EGA hosted it’s 2nd annual museum golf tournament, bringing friends together for a day of fun and competition. 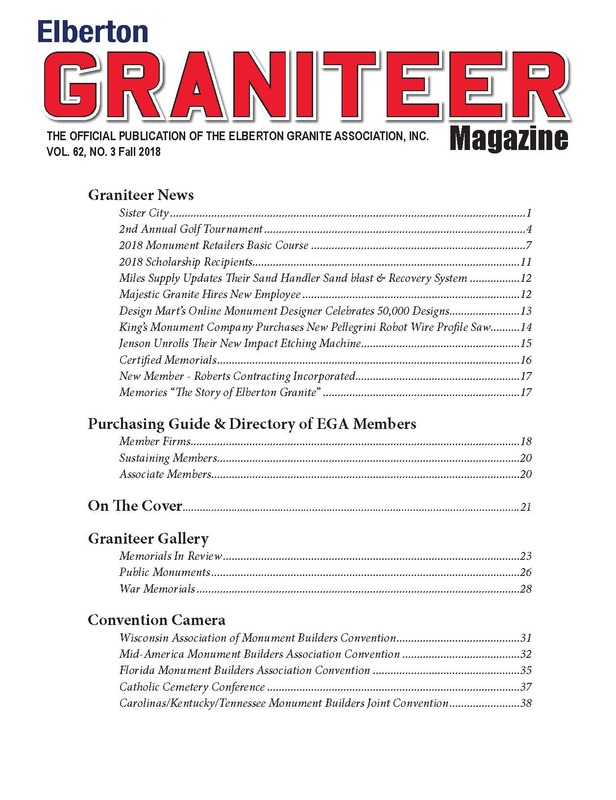 Another year of wonderful Graniteers were published, showcasing Elberton and its granite industry. Lastly, EGA members produced thousands and thousands of beautiful granite products, which were shipped all across this country. With the highs, we also had some lows. Most notably, we experienced the passing of 14 current or former members of the EGA. We are a family, just like any other family and when we lose a member, past or present, it is a loss we all share. We understand however, that life is brief, and we only have a short amount of time to make our mark on it. The 14 members that have passed on left a tremendous mark on us and what we do, so that should be a high point for all of us as well. So, as we bring this year to a close, we are thankful for all of the highs and all of the lows. 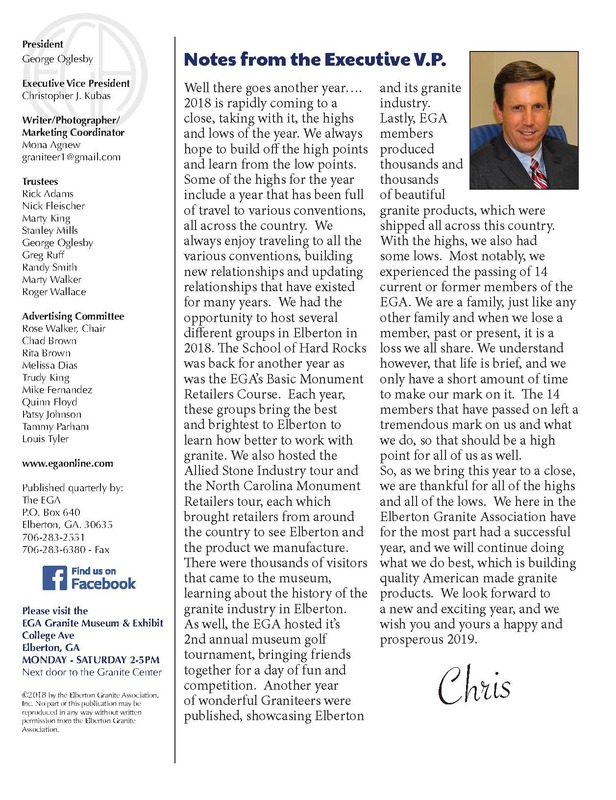 We here in the Elberton Granite Association have for the most part had a successful year, and we will continue doing what we do best, which is building quality American made granite products. We look forward to a new and exciting year, and we wish you and yours a happy and prosperous 2019. 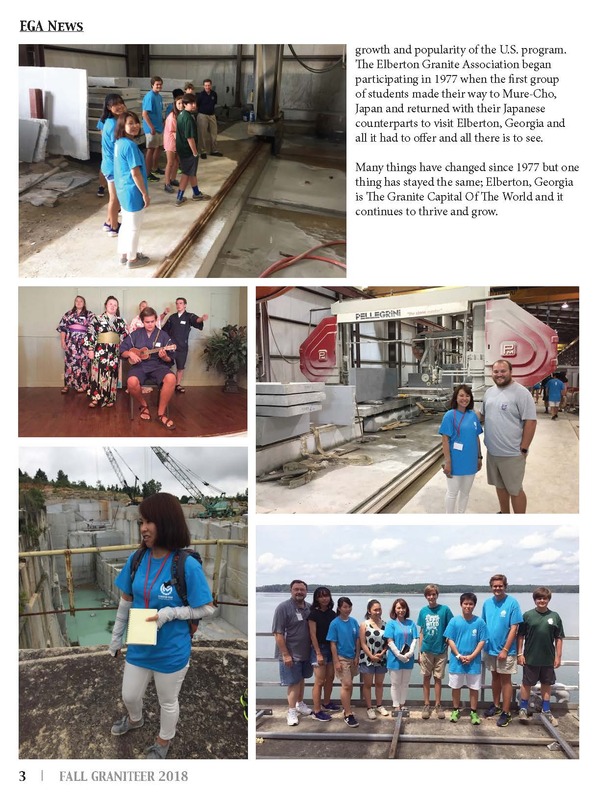 Elberton Granite Association Hosts Sister City Exchange Students For the past 41 years the Elberton Granite Association has been honored to participate in the Sister City Program set up with Mure, Japan. This program allows students to visit Mure and then come home bringing their host students with them and tour Elberton and the surrounding area. 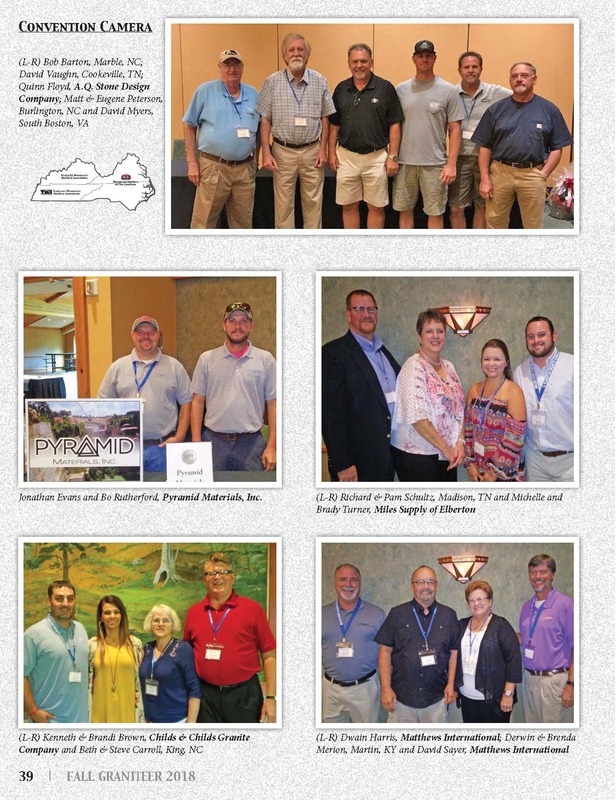 The group spent July 30, 2018 touring the granite industry with their chaperon, Tom Evans, Jr of Evanswinn International and Chris Kubas. The group enjoyed the beautiful sunshine filled day visiting the Georgia Guidestones, the Elberton Granite Museum & Exhibit, the Beaverdam Quarry and Richard B. Russell dam and lake. They also toured Eagle Granite’s production plant where they learned how granite is taken from blocks and fashioned into the monuments and memorials that are seen in everyday life. While at the Elberton Granite Museum, the students learned about the amazing story of Dutchy and his journey from creation to how he arrived at the museum. They saw the tools used to once harvest granite from the earth and the ones used to manufacture it into monuments. After all of this, the students were ushered to the Elberton Civic Center where they enjoyed a delicious Georgia fashioned BBQ lunch and got in from the sun for a little while. After lunch they were off to Richard B. Russell lake and dam for more fun learning experiences. 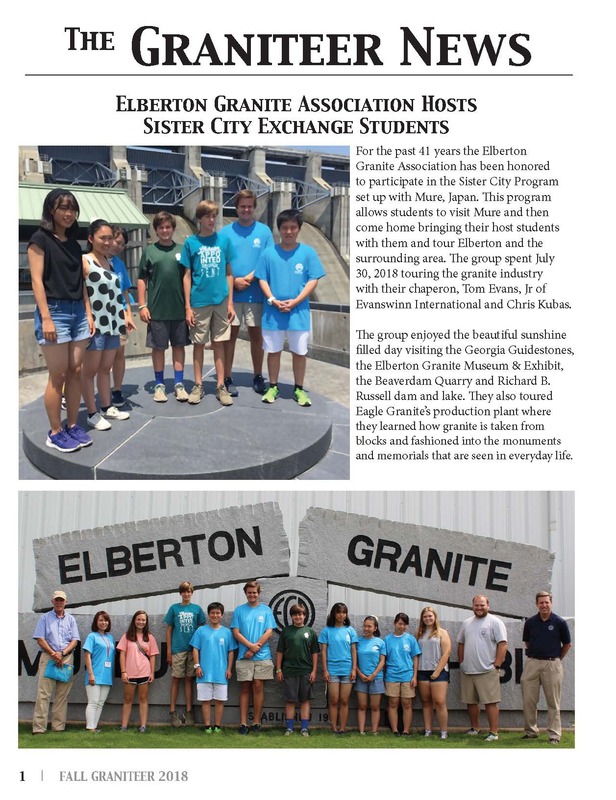 The Elberton Granite Association is always proud to participate with the Sister City Exchange program. The program allows the younger generation an opportunity to grow and to see how relationships can bridge a gap between cultures. The U.S. sister city program actually began in 1956 when President Dwight D. Eisenhower proposed a people-to-people, citizen diplomacy initiative. Originally a program of the National League of Cities, Sister Cities International became a separate, nonprofit corporation in 1967, due to the growth and popularity of the U.S. program. 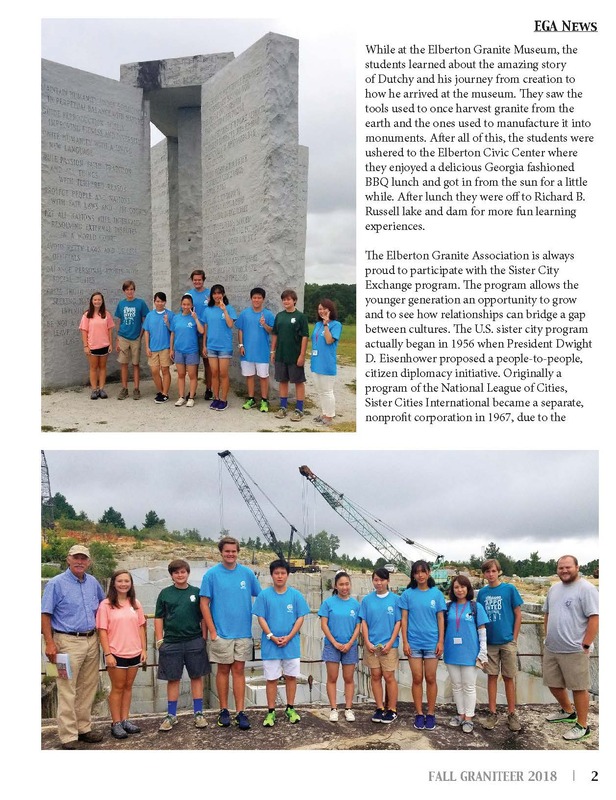 The Elberton Granite Association began participating in 1977 when the first group of students made their way to Mure-Cho, Japan and returned with their Japanese counterparts to visit Elberton, Georgia and all it had to offer and all there is to see. Many things have changed since 1977 but one thing has stayed the same; Elberton, Georgia is The Granite Capital Of The World and it continues to thrive and grow. 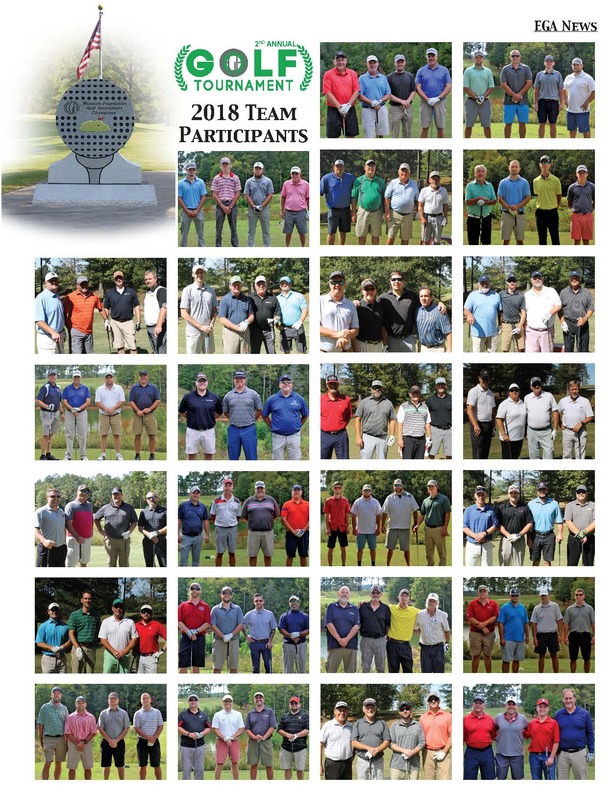 Elberton Granite Association Hosts The Second Annual Golf Tournament The sun shone brightly and the breeze gently blew as the Elberton Granite Association’s second annual golf tournament kicked off on October 19th. 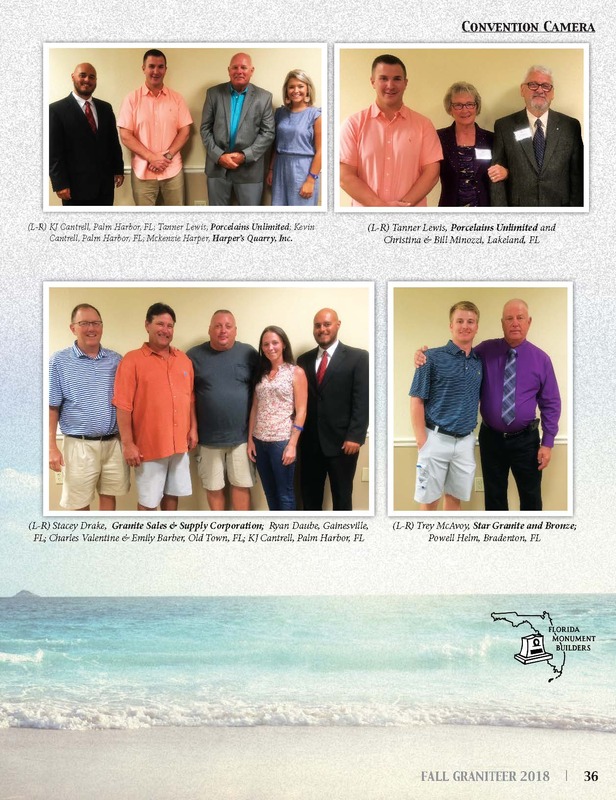 The event was held at the beautiful Arrowhead Pointe Golf Course at Richard B. Russell State Park. Players from all over Elberton and the surrounding area came together in the spirit of fun and purpose. 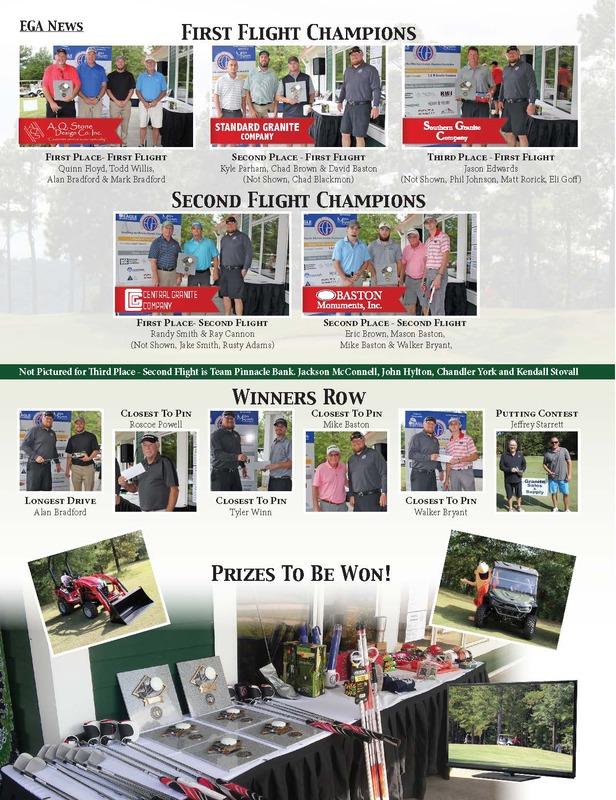 Prizes of the day were an array of goodies that every golf enthusiast would love to have including a Calloway Epic Driver, a Ping Glide Wedge, a Scotty Camron Putter, a Tour Edge Putter, TaylorMade Noodle+ Golf Balls, Domestic Airfare for two, Golf passes, a big screen TV, cash money and many more not listed. The big ticket prize for the Hole in One included your choice of a Mahindra Side by Side or Tractor for the Hole in One Prize. Though nobody hit a hole in one on the 13th hole, everybody enjoyed dreaming about owning the Mahindra tractor or side by side. It was certainly not for lack of trying that these prizes didn’t get driven off the course by a player. All the proceeds from the day are to further the efforts on public education about the granite industry through the growth of our Elberton Granite Museum. Much can be taught to our future generations by taking what the men and women before us have laid out and continuing to learn from it. It is important to the granite industry to always keep our future growing in the right directions. 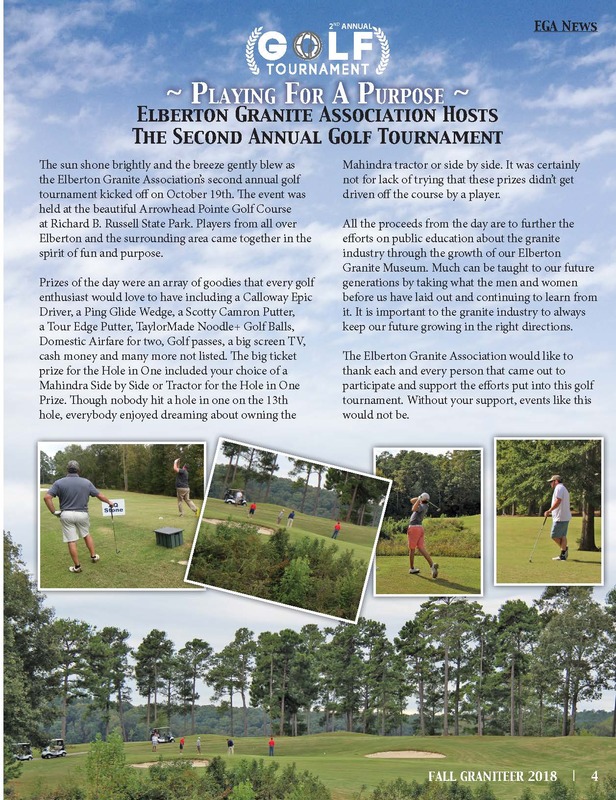 The Elberton Granite Association would like to thank each and every person that came out to participate and support the efforts put into this golf tournament. Without your support, events like this would not be. 2018 Monument Retailers Basic Course The 2018 Monument Retailers Basic Course kicked off with a bang with Beaverdam Quarry being one of our first locations to visit. Here the class was able to see first hand the process of quarrying granite from the earth and the work involved in that process. Many times, viewing this great task first hand helps to gain an appreciation of how hard the job is and the work, dedication and danger involved in such a task. The class also spent their first day walking through Eagle Granite Company’s plant. Here they saw how once a block is quarried it is processed into a monument shape and turned into a beautiful memorial. The tour included seeing blocks being cut by gantry saws, a 3D CNC machine being set up, polishing machines at work, and slab cutters splitting granite. The class also had the opportunity to watch as stone cutters rock pitched monuments with a chisel and hammer. Toward the end of the tour, the class watched as stencil was cut and placed onto granite monuments. It was then sent on to be sandblasted.Southern Mausoleums was another stop for the class on Monday. At Southern Mausoleums, Jesse Hernandez took the class on a tour through the plant explaining the different ways that mausoleums are constructed. During this visit the class had the added bonus of seeing a stone carver chiseling on the base of a column to finalize the finishing touches of the design. 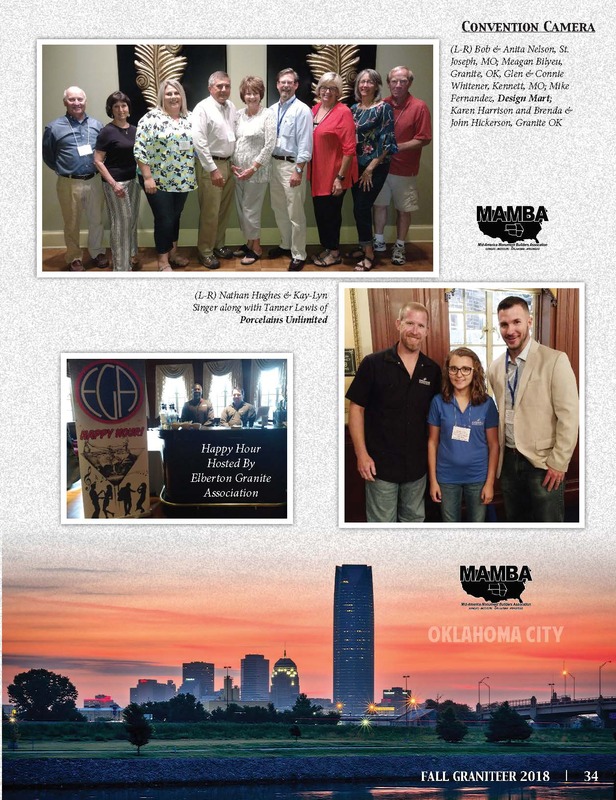 Tuesday was spent with several member firms that graciously allowed the class to come and view demonstrations and watch as certain tasks are performed in the monument industry. Bicknell Supply Company had their team come together to speak on the many products that are used in all phases of the monument business with emphasis on epoxies and sealants. Several clamps were shown and discussed and later a demonstration of a clamp was done while the class was at River Edge Granite Company. Greg Ruff demonstrated foundation preparation and spent time with a hands on demonstration of setting an actual monument. Mart Clamp demonstrated how to clean a monument and replace the lithochrome afterward. Brian Jenson with Jenson Etching gave the class a tour through their facility and spoke on the different capabilities of etching on granite. Demonstrations of laser, hand etching and painting were given as the class asked each artist many questions. 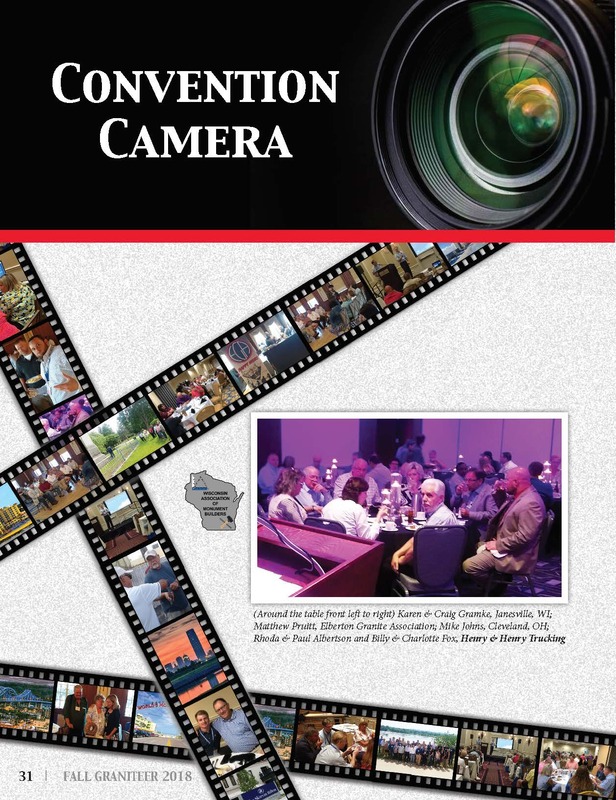 George Arnold with Glass Art Imaging spoke on the advances in the granite industry with his patented technology of adding colored images to granite. Henry and Henry discussed the ways to load and unload a truck along with different techniques used to maneuver odd shaped stones. Thursday was spent on the road again visiting several member firms. Miles Supply spoke on the different cleaning products used in cleaning monuments and gave a tour of their facility. The class visited Design Mart where Mike Fernandez discussed the digital design of monuments and symbolism used on them. A slide show was given of different monuments in a local cemetery and the symbolism on each monument was discussed. Later that day, Quinn Floyd from A.Q. Design visited the classroom where he discussed graphic design in the new age and techniques used for design of monuments. 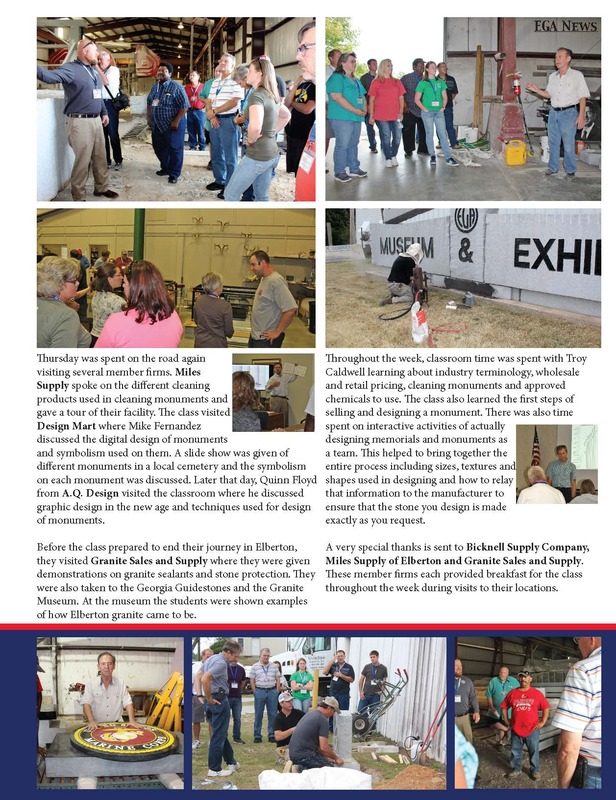 Before the class prepared to end their journey in Elberton, they visited Granite Sales and Supply where they were given demonstrations on granite sealants and stone protection. They were also taken to the Georgia Guidestones and the Granite Museum. At the museum the students were shown examples of how Elberton granite came to be. Throughout the week, classroom time was spent with Troy Caldwell learning about industry terminology, wholesale and retail pricing, cleaning monuments and approved chemicals to use. The class also learned the first steps of selling and designing a monument. There was also time spent on interactive activities of actually designing memorials and monuments as a team. This helped to bring together the entire process including sizes, textures and shapes used in designing and how to relay that information to the manufacturer to ensure that the stone you design is made exactly as you request. 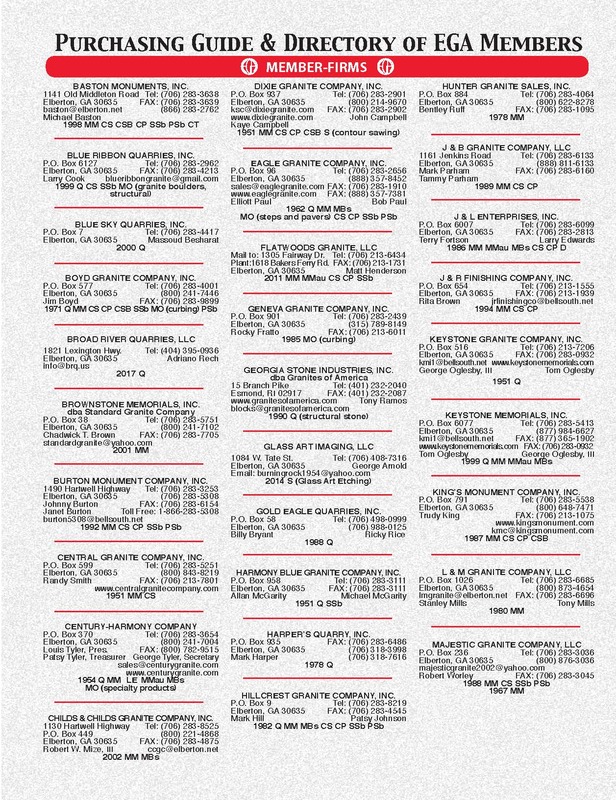 A very special thanks is sent to Bicknell Supply Company, Miles Supply of Elberton and Granite Sales and Supply. These member firms each provided breakfast for the class throughout the week during visits to their locations. 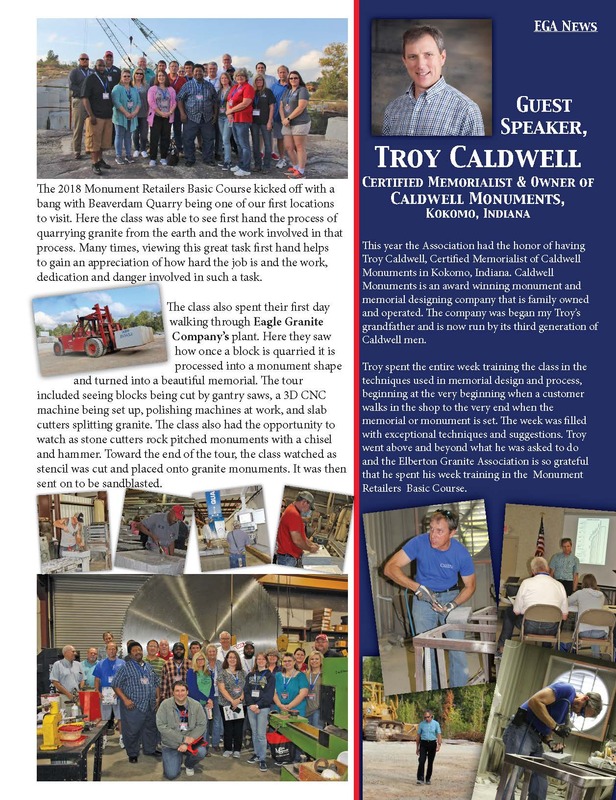 Guest Speaker, Troy Caldwell Certified Memorialist & Owner of Caldwell Monuments, Kokomo, Indiana This year the Association had the honor of having Troy Caldwell, Certified Memorialist of Caldwell Monuments in Kokomo, Indiana. Caldwell Monuments is an award winning monument and memorial designing company that is family owned and operated. The company was began my Troy’s grandfather and is now run by its third generation of Caldwell men. Troy spent the entire week training the class in the techniques used in memorial design and process, beginning at the very beginning when a customer walks in the shop to the very end when the memorial or monument is set. The week was filled with exceptional techniques and suggestions. 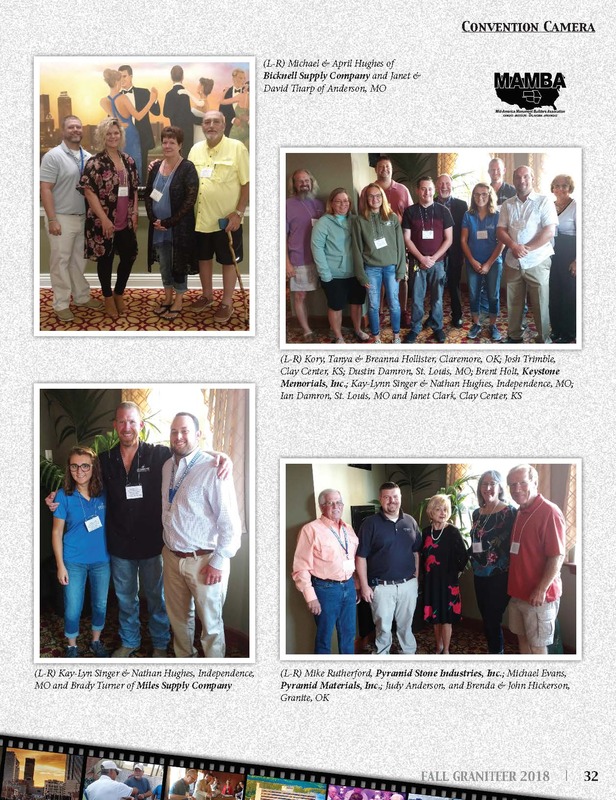 Troy went above and beyond what he was asked to do and the Elberton Granite Association is so grateful that he spent his week training in the Monument Retailers Basic Course. Congratulations to the Class of 2018 Scholarship Recipients! Each year, the EGA awards three scholarships to local graduating seniors to help further their educations. 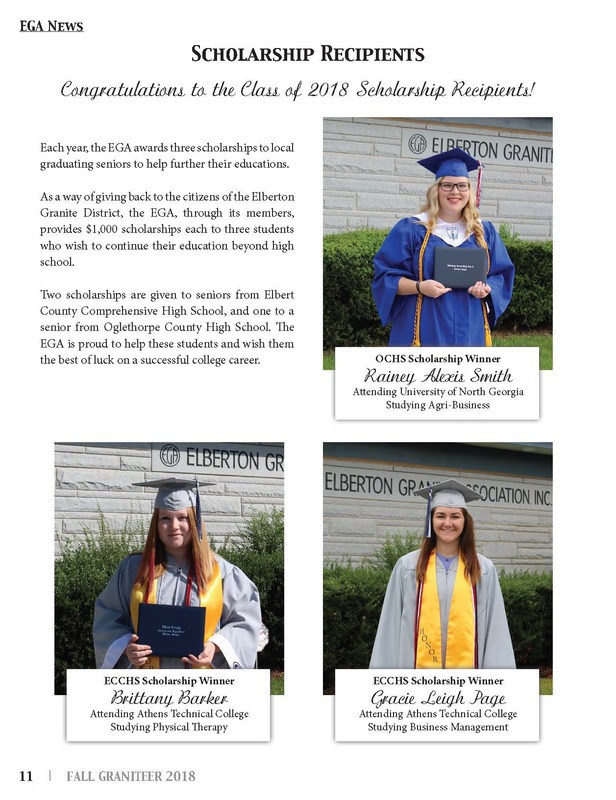 As a way of giving back to the citizens of the Elberton Granite District, the EGA, through its members, provides $1,000 scholarships each to three students who wish to continue their education beyond high school. Two scholarships are given to seniors from Elbert County Comprehensive High School, and one to a senior from Oglethorpe County High School. The EGA is proud to help these students and wish them the best of luck on a successful college career. Miles Supply Upgraded Their Automated SandHandler Sandblast & Recovery System Miles Supply of Elberton recently spent time renovating their fully automated SandHandler sandblast and recovery system. Miles Supply exclusively sells the industry’s only complete sandblasting and abrasive recovery system all-in-one, featuring advanced servo motor engineering for precise stone engraving. With this system, the need for pits are alleviated and there is no need for shoveling sand. The system is set up to be simple with an automatic and a manual capability. There are eight patterns that are completely independent of each other. The system can be set up to process one stone or up to eight stones. The touch-screen and joystick outside of the booth makes for extremely easy set-up. The chamber is built with double walled steel construction and lined with rubber interior walls for a totally enclosed and sealed environment. This eliminates abrasive loss, dust outside the booth and moisture from the abrasive providing a cleaner, quieter work area to protect employee’s health. As the stone is being sandblasted the abrasive is screened and collected for reuse with no downtime and no compressor air is consumed in recovering the grit. Clogged nozzles are completely eliminated with no shutdown time for unplugging the nozzles. The sandblast room comes equipped with pass-through doors on each end, to allow easy in and out of the stone on a conveyor system. Stone to stone feature is included. The SandHandler comes in three sizes. The machine can, however, be customized to be a better fit for your size requirements. 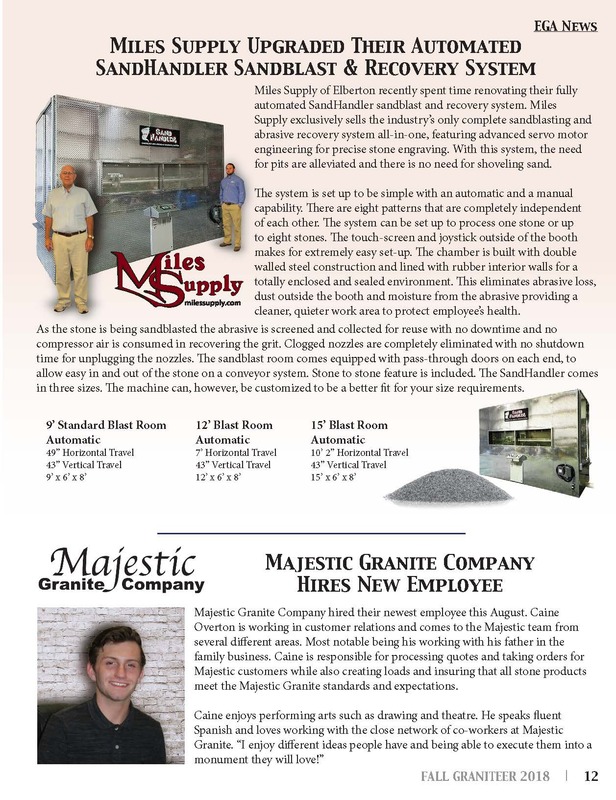 Majestic Granite Company Hires New Employee Majestic Granite Company hired their newest employee this August. Caine Overton is working in customer relations and comes to the Majestic team from several different areas. Most notable being his working with his father in the family business. Caine is responsible for processing quotes and taking orders for Majestic customers while also creating loads and insuring that all stone products meet the Majestic Granite standards and expectations. Caine enjoys performing arts such as drawing and theatre. He speaks fluent Spanish and loves working with the close network of co-workers at Majestic Granite. “I enjoy different ideas people have and being able to execute them into a monument they will love!” Design Mart’s Online Monument Designer Celebrates 50,000 and Still Going Strong When performing updates this summer, the Design Mart team just happened to notice that more than 50,000 unique monuments had been designed and stored in users’ dashboards. 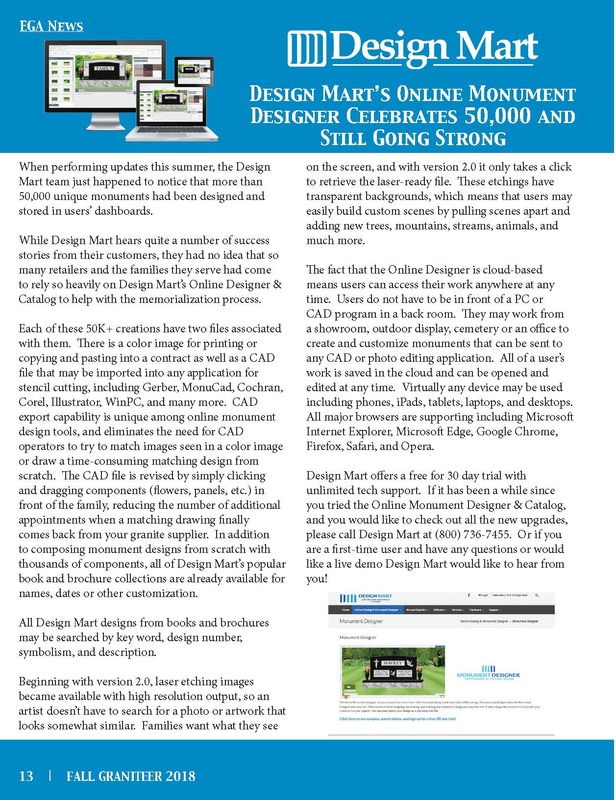 While Design Mart hears quite a number of success stories from their customers, they had no idea that so many retailers and the families they serve had come to rely so heavily on Design Mart’s Online Designer & Catalog to help with the memorialization process. Each of these 50K+ creations have two files associated with them. There is a color image for printing or copying and pasting into a contract as well as a CAD file that may be imported into any application for stencil cutting, including Gerber, MonuCad, Cochran, Corel, Illustrator, WinPC, and many more. CAD export capability is unique among online monument design tools, and eliminates the need for CAD operators to try to match images seen in a color image or draw a time-consuming matching design from scratch. The CAD file is revised by simply clicking and dragging components (flowers, panels, etc.) in front of the family, reducing the number of additional appointments when a matching drawing finally comes back from your granite supplier. 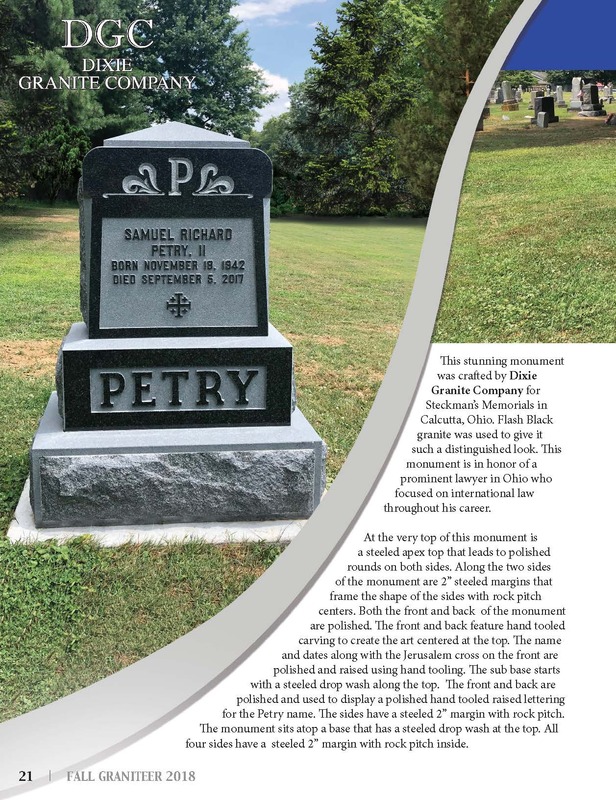 In addition to composing monument designs from scratch with thousands of components, all of Design Mart’s popular book and brochure collections are already available for names, dates or other customization. All Design Mart designs from books and brochures may be searched by key word, design number, symbolism, and description. Beginning with version 2.0, laser etching images became available with high resolution output, so an artist doesn’t have to search for a photo or artwork that looks somewhat similar. Families want what they see on the screen, and with version 2.0 it only takes a click to retrieve the laser-ready file. These etchings have transparent backgrounds, which means that users may easily build custom scenes by pulling scenes apart and adding new trees, mountains, streams, animals, and much more. The fact that the Online Designer is cloud-based means users can access their work anywhere at any time. Users do not have to be in front of a PC or CAD program in a back room. They may work from a showroom, outdoor display, cemetery or an office to create and customize monuments that can be sent to any CAD or photo editing application. All of a user’s work is saved in the cloud and can be opened and edited at any time. Virtually any device may be used including phones, iPads, tablets, laptops, and desktops. All major browsers are supporting including Microsoft Internet Explorer, Microsoft Edge, Google Chrome, Firefox, Safari, and Opera. Design Mart offers a free for 30 day trial with unlimited tech support. If it has been a while since you tried the Online Monument Designer & Catalog, and you would like to check out all the new upgrades, please call Design Mart at (800) 736-7455. Or if you are a first-time user and have any questions or would like a live demo Design Mart would like to hear from you! 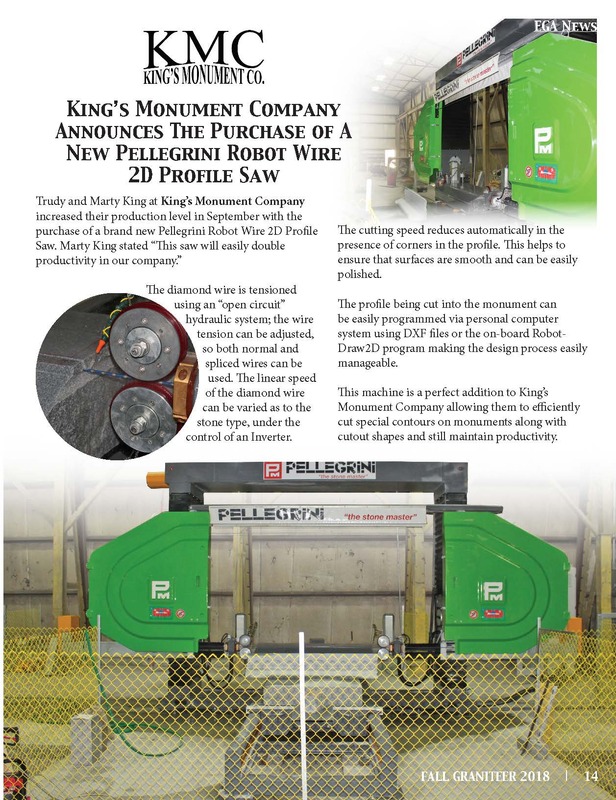 King’s Monument Company Announces The Purchase of A New Pellegrini Robot Wire 2D Profile Saw Trudy and Marty King at King’s Monument Company increased their production level in September with the purchase of a brand new Pellegrini Robot Wire 2D Profile Saw. Marty King stated “This saw will easily double productivity in our company.” The diamond wire is tensioned using an “open circuit” hydraulic system; the wire tension can be adjusted, so both normal and spliced wires can be used. The linear speed of the diamond wire can be varied as to the stone type, under the control of an Inverter. The cutting speed reduces automatically in the presence of corners in the profile. This helps to ensure that surfaces are smooth and can be easily polished. The profile being cut into the monument can be easily programmed via personal computer system using DXF files or the on-board Robot-Draw2D program making the design process easily manageable. This machine is a perfect addition to King’s Monument Company allowing them to efficiently cut special contours on monuments along with cutout shapes and still maintain productivity. 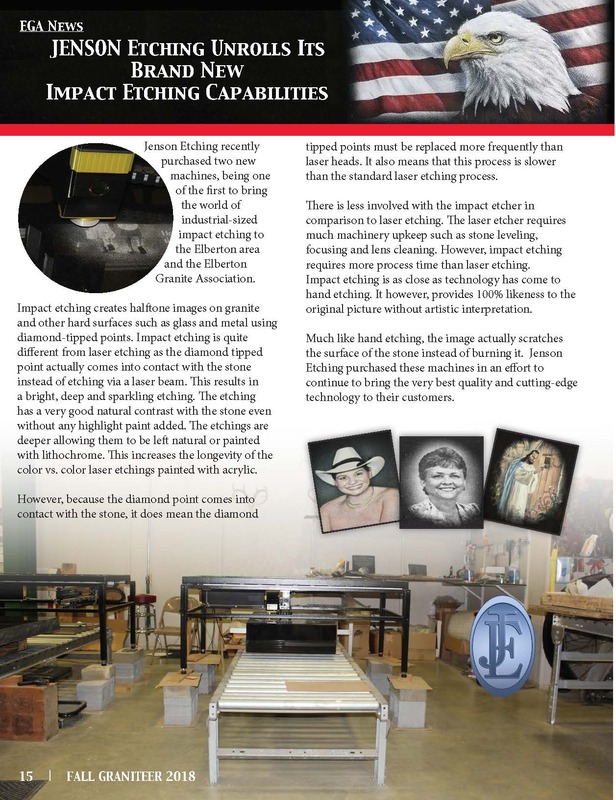 JENSON Etching Unrolls Its Brand New Impact Etching Capabilities Jenson Etching recently purchased two new machines, being one of the first to bring the world of industrial-sized impact etching to the Elberton area	and the Elberton Granite Association. Impact etching creates halftone images on granite and other hard surfaces such as glass and metal using diamond-tipped points. Impact etching is quite different from laser etching as the diamond tipped point actually comes into contact with the stone instead of etching via a laser beam. This results in a bright, deep and sparkling etching. The etching has a very good natural contrast with the stone even without any highlight paint added. The etchings are deeper allowing them to be left natural or painted with lithochrome. This increases the longevity of the color vs. color laser etchings painted with acrylic. However, because the diamond point comes into contact with the stone, it does mean the diamond tipped points must be replaced more frequently than laser heads. It also means that this process is slower than the standard laser etching process. There is less involved with the impact etcher in comparison to laser etching. The laser etcher requires much machinery upkeep such as stone leveling, focusing and lens cleaning. However, impact etching requires more process time than laser etching. Impact etching is as close as technology has come to hand etching. It however, provides 100% likeness to the original picture without artistic interpretation. Much like hand etching, the image actually scratches the surface of the stone instead of burning it. Jenson Etching purchased these machines in an effort to continue to bring the very best quality and cutting-edge technology to their customers. 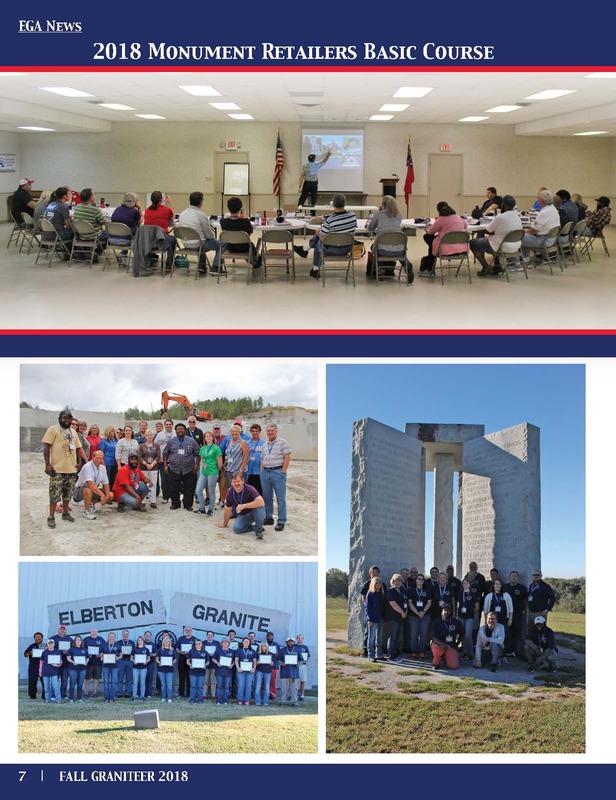 The Elberton Granite Association Guarantees Quality with Their Certified Memorial Program In 1964 The Elberton Granite Association began offering a written guarantee. It was backed by the entire membership of the Association and was a major commitment for the individual member-firms. 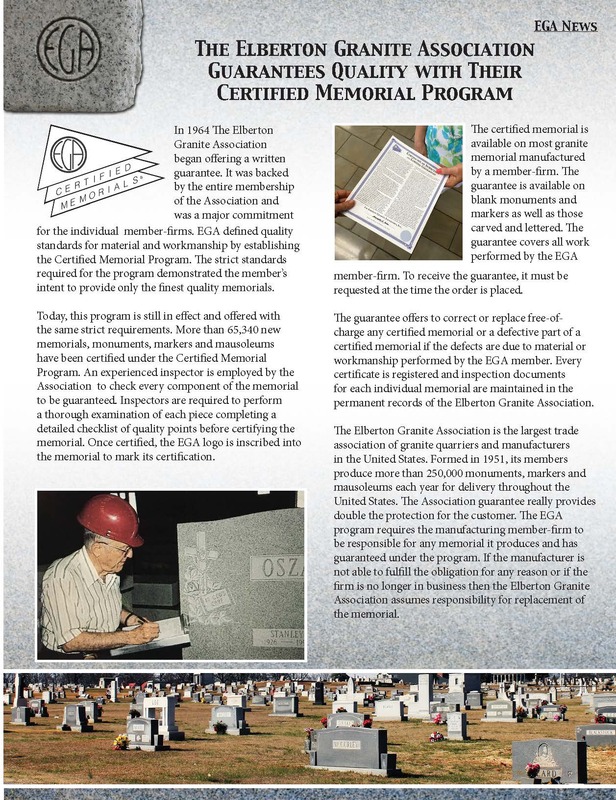 EGA defined quality standards for material and workmanship by establishing the Certified Memorial Program. The strict standards required for the program demonstrated the member’s intent to provide only the finest quality memorials. Today, this program is still in effect and offered with the same strict requirements. More than 65,340 new memorials, monuments, markers and mausoleums have been certified under the Certified Memorial Program. An experienced inspector is employed by the Association to check every component of the memorial to be guaranteed. Inspectors are required to perform a thorough examination of each piece completing a detailed checklist of quality points before certifying the memorial. Once certified, the EGA logo is inscribed into the memorial to mark its certification. 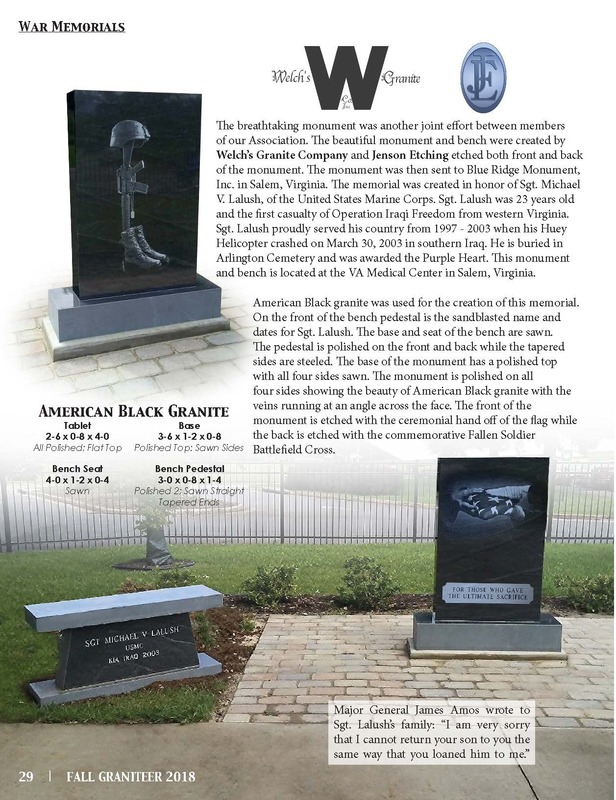 The certified memorial is available on most granite memorial manufactured by a member-firm. The guarantee is available on blank monuments and markers as well as those carved and lettered. The guarantee covers all work performed by the EGA member-firm. To receive the guarantee, it must be requested at the time the order is placed. 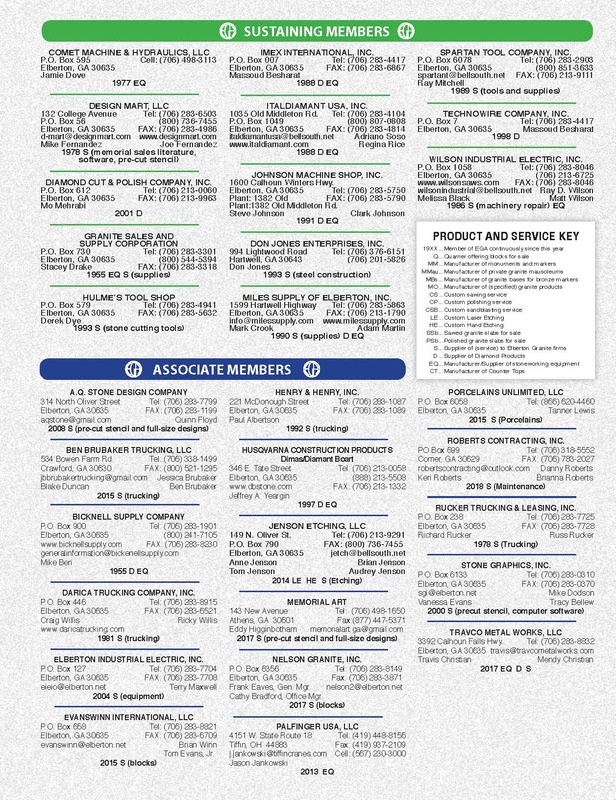 The guarantee offers to correct or replace free-of-charge any certified memorial or a defective part of a certified memorial if the defects are due to material or workmanship performed by the EGA member. Every certificate is registered and inspection documents for each individual memorial are maintained in the permanent records of the Elberton Granite Association. 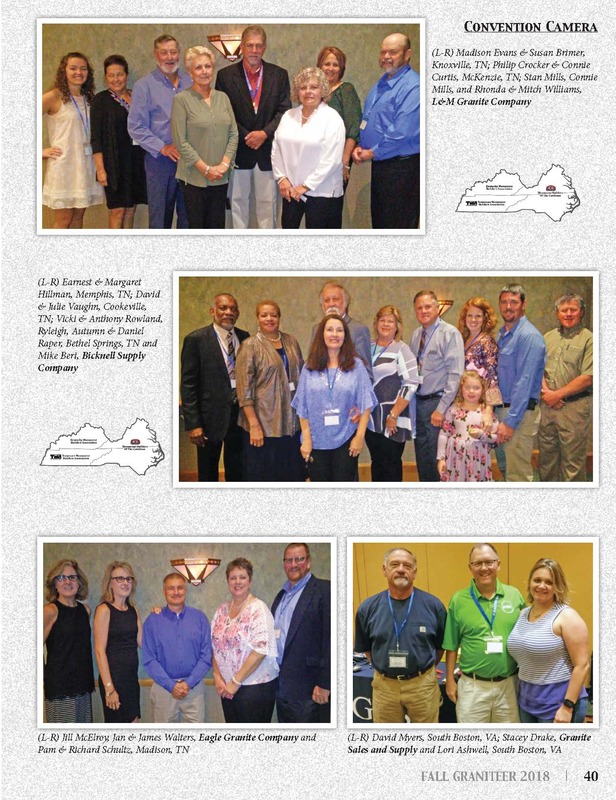 The Elberton Granite Association is the largest trade association of granite quarriers and manufacturers in the United States. Formed in 1951, its members produce more than 250,000 monuments, markers and mausoleums each year for delivery throughout the United States. The Association guarantee really provides double the protection for the customer. The EGA program requires the manufacturing member-firm to be responsible for any memorial it produces and has guaranteed under the program. 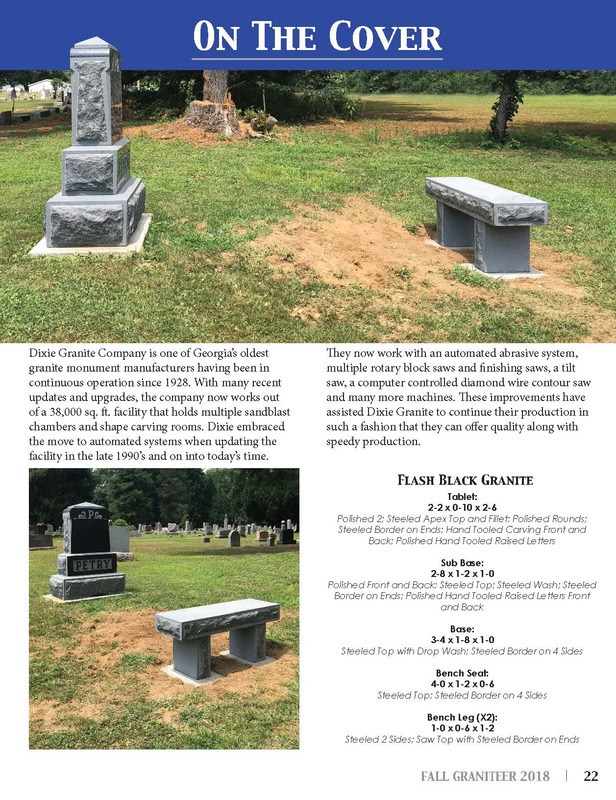 If the manufacturer is not able to fulfill the obligation for any reason or if the firm is no longer in business then the Elberton Granite Association assumes responsibility for replacement of the memorial. 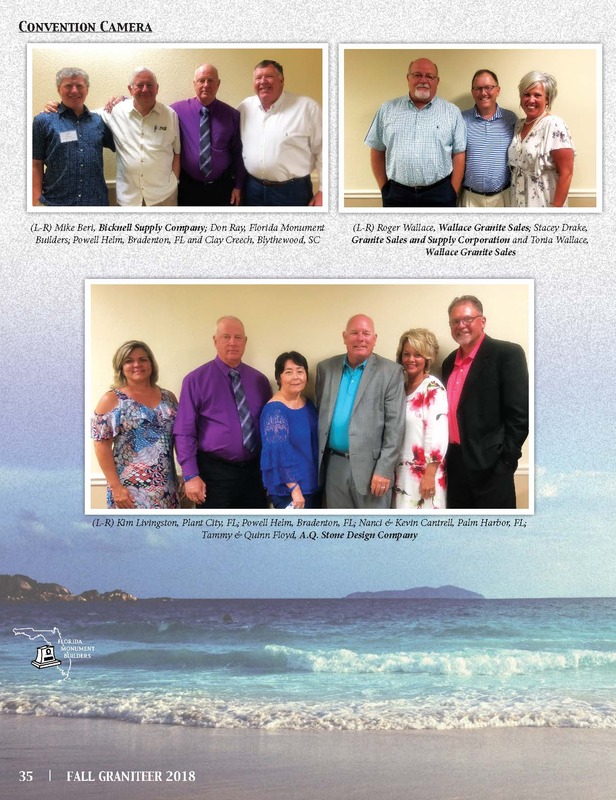 The Elberton Granite Association Welcomes Roberts Contracting Incorporated The Elberton Granite Association would like to give a warm welcome to Roberts Contacting Incorporated. Roberts Contracting is a family owned company that specializes in several areas of the construction and fabrication industry. The company is owned by Danny Roberts and his family. The company was founded in 1994 and is based out of Carlton, Georgia. As a family owned and operated company they pride themselves in quality of work and striving to meet all the needs of their metal customers. Danny Roberts has roughly 35 years of experience in the metal fabrication industry. As a licensed general contractor, they cover a wide variety of contracting needs including metal building erection and metal fabrication. They also fabricate truck mounted slab racks, A-frames and stairs. 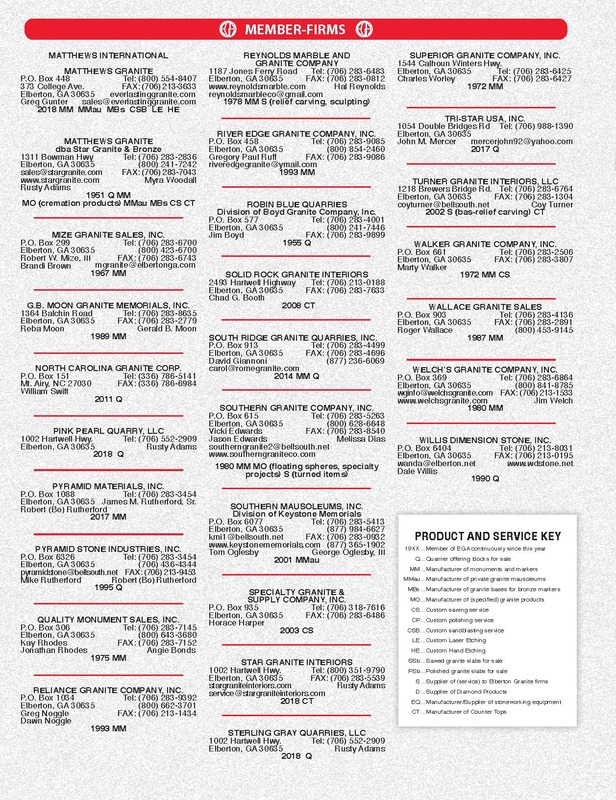 RCI also offers diamond saw and granite machinery fabrication from the ground up, including planning, developing, grading, concrete, fabrication, metal building erection and installing of all machinery. Along with the metal building work, RCI also focuses on crane hoist sales. Within their crane hoist division they can meet a variety of a company’s crane system needs ranging in sizes. RCI also serves as a crane repair company. As times have changed, so has the company and within the last few years RCI has added new divisions of their company. They now offer grading and hauling services as well as various equipment rentals including a boom truck, skid steer and man lift rentals. This service comes with experienced operators and transportation in the base cost. 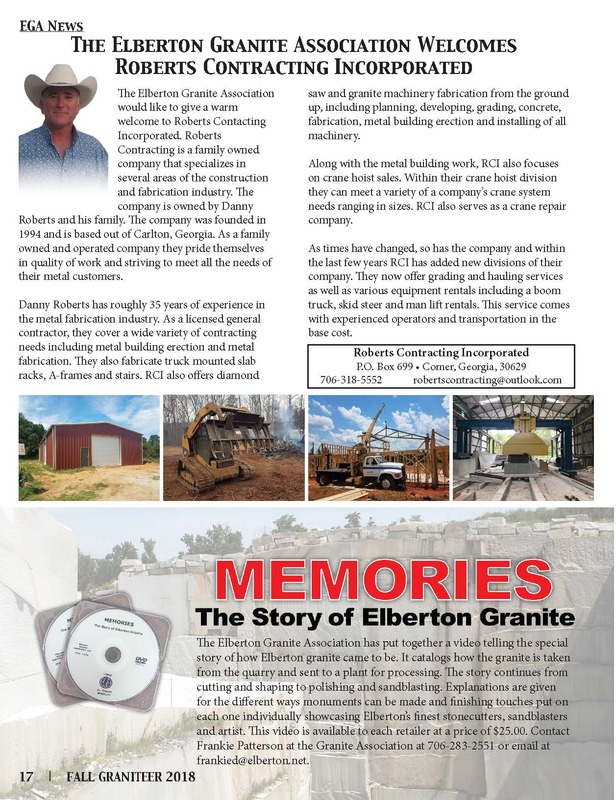 The Elberton Granite Association has put together a video telling the special story of how Elberton granite came to be. It catalogs how the granite is taken from the quarry and sent to a plant for processing. The story continues from cutting and shaping to polishing and sandblasting. Explanations are given for the different ways monuments can be made and finishing touches put on each one individually showcasing Elberton’s finest stonecutters, sandblasters and artist. This video is available to each retailer at a price of $25.00. Contact Frankie Patterson at the Granite Association at 706-283-2551 or email at frankied@elberton.net. This stunning monument was crafted by Dixie Granite Company for Steckman’s Memorials in Calcutta, Ohio. Flash Black granite was used to give it such a distinguished look. This monument is in honor of a prominent lawyer in Ohio who focused on international law throughout his career. At the very top of this monument is a steeled apex top that leads to polished rounds on both sides. Along the two sides of the monument are 2” steeled margins that frame the shape of the sides with rock pitch centers. Both the front and back of the monument are polished. The front and back feature hand tooled carving to create the art centered at the top. The name and dates along with the Jerusalem cross on the front are polished and raised using hand tooling. The sub base starts with a steeled drop wash along the top. The front and back are polished and used to display a polished hand tooled raised lettering for the Petry name. The sides have a steeled 2” margin with rock pitch. The monument sits atop a base that has a steeled drop wash at the top. All four sides have a steeled 2” margin with rock pitch inside. Dixie Granite Company is one of Georgia’s oldest granite monument manufacturers having been in continuous operation since 1928. With many recent updates and upgrades, the company now works out of a 38,000 sq. ft. facility that holds multiple sandblast chambers and shape carving rooms. Dixie embraced the move to automated systems when updating the facility in the late 1990’s and on into today’s time. They now work with an automated abrasive system, multiple rotary block saws and finishing saws, a tilt saw, a computer controlled diamond wire contour saw and many more machines. These improvements have assisted Dixie Granite to continue their production in such a fashion that they can offer quality along with speedy production. Sometimes you come across monuments and memorials that simply require few words. 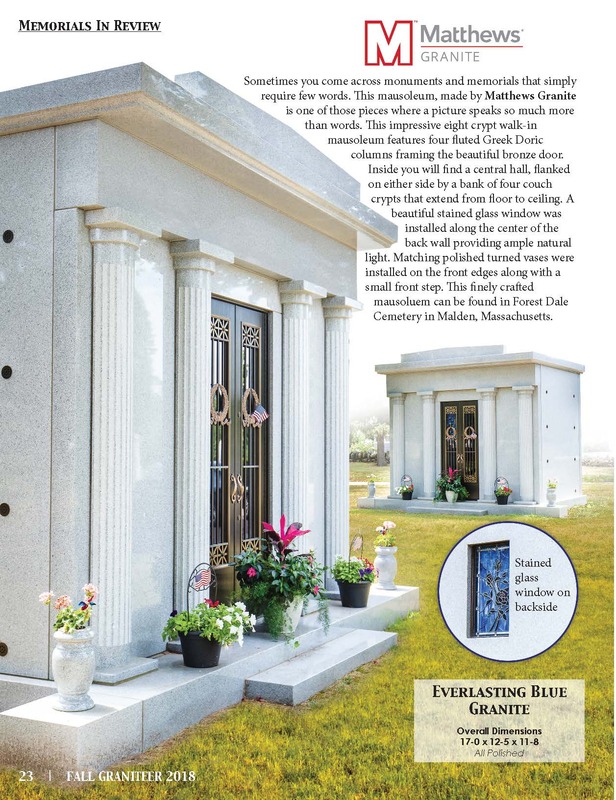 This mausoleum, made by Matthews Granite is one of those pieces where a picture speaks so much more than words. This impressive eight crypt walk-in mausoleum features four fluted Greek Doric columns framing the beautiful bronze door. Inside you will find a central hall, flanked on either side by a bank of four couch crypts that extend from floor to ceiling. A beautiful stained glass window was installed along the center of the back wall providing ample natural light. Matching polished turned vases were installed on the front edges along with a small front step. This finely crafted mausoluem can be found in Forest Dale Cemetery in Malden, Massachusetts. Southern Granite Company created this stunning monument for Schultz Monument Company in Madison, Tennessee. The monument is made from Medium Blue granite and features an all steeled turned vase between two prominent fluted columns. Two caps were placed across the top to complete the monument. The base has a steeled top and 2” steeled margin with the remainder rock pitched around the sides. Engraved is “Father, Husband, Mentor. The Best Whiskey Maker The World Never Knew.” This epitaph signifies a story that runs deep in the world of whiskey making. This monument is in memory of Nathan “Nearest” Green, the first African-American master distiller on record in the United States. Uncle Nearest (the name he was fondly known by) mentored Jack Daniel, a teenage boy who recently lost his parents, in the art of distillery more than 150 years ago. Uncle Nearest was Jack’s teacher, mentor and friend. The two families, to this day, still consider each side “family”. Nearest was loved by all and was known for his triumph from slavery to one of the wealthiest African-Americans in the Lynchburg, Tennessee area This had much to do with his legacy of excellence. His friendship with Jack Daniel was quite the unusual situation, but he and Jack had a friendship that ran deep. The family just did not feel the monument was complete without including something from the famous whiskey process that Uncle Nearest dedicated his life to. So inside the vase is a sealed clear cylinder that is filled with sugar maple charcoal, one thing that makes Jack Daniel whiskey taste the way that it does. 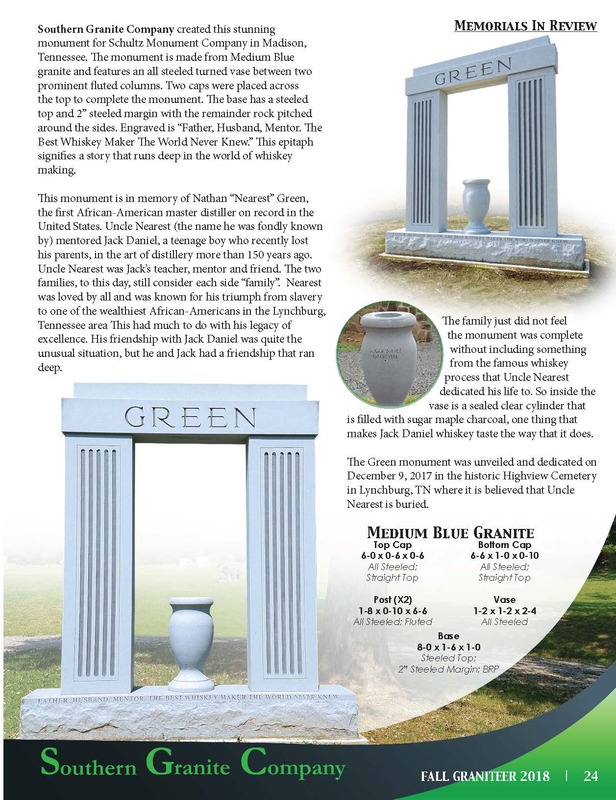 The Green monument was unveiled and dedicated on December 9, 2017 in the historic Highview Cemetery in Lynchburg, TN where it is believed that Uncle Nearest is buried. 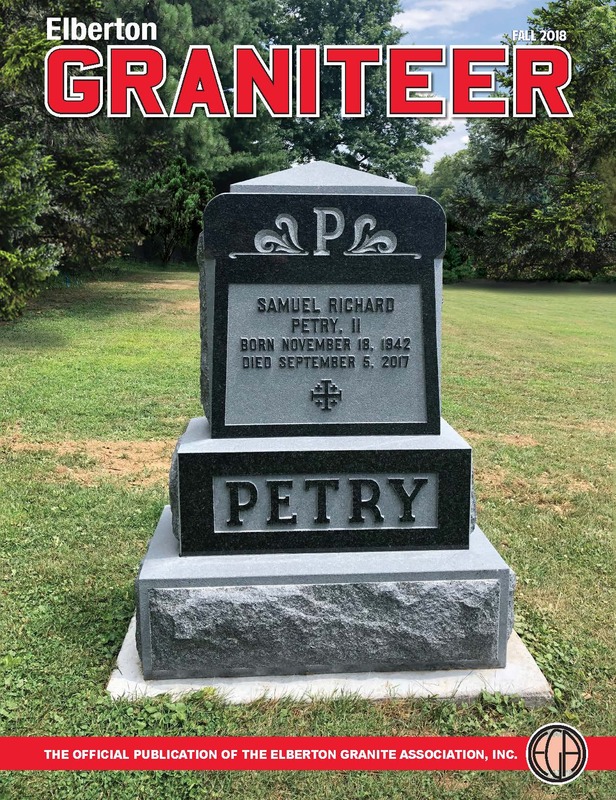 River Edge Granite Company has given us the perfect example of how a granite block taken from the earth can be formed into something that now tells a story about a person dearly loved and all that they cherished on this earth. Andruw Brown loved many things. One of his most passionate was basketball, fishing and snowboarding. His mother states “I wasn’t sure exactly what I wanted, but it has to be different and special just like Andruw.” Keeton Monuments contacted River Edge and together they all made this spectacular monument a reality. 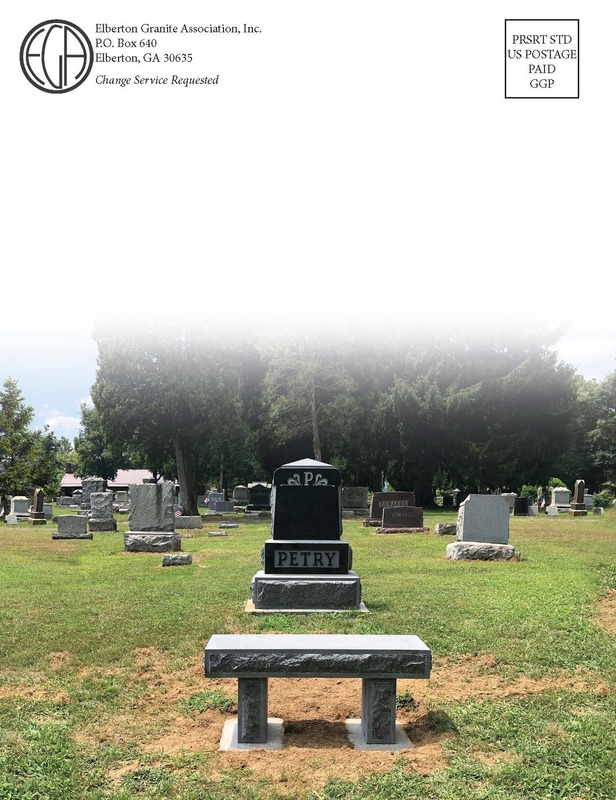 This monument is located in Bells Campground Cemetery in Powell, Tennessee. King’s Monument Company crafted this memorial for Geneseo Memorials and Bronze located in Geneseo, Illinois. 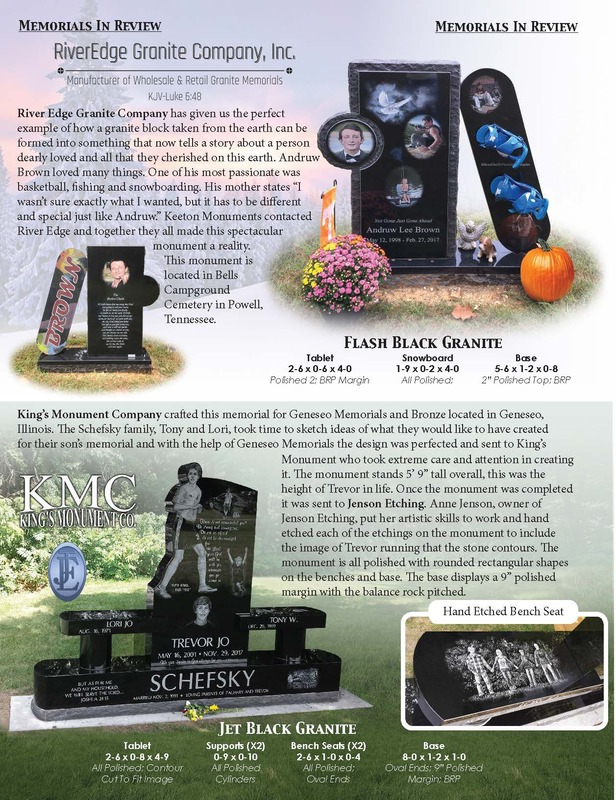 The Schefsky family, Tony and Lori, took time to sketch ideas of what they would like to have created for their son’s memorial and with the help of Geneseo Memorials the design was perfected and sent to King’s Monument who took extreme care and attention in creating it. The monument stands 5’ 9” tall overall, this was the height of Trevor in life. Once the monument was completed it was sent to Jenson Etching. Anne Jenson, owner of Jenson Etching, put her artistic skills to work and hand etched each of the etchings on the monument to include the image of Trevor running that the stone contours. The monument is all polished with rounded rectangular shapes on the benches and base. The base displays a 9” polished margin with the balance rock pitched. E.G.A. 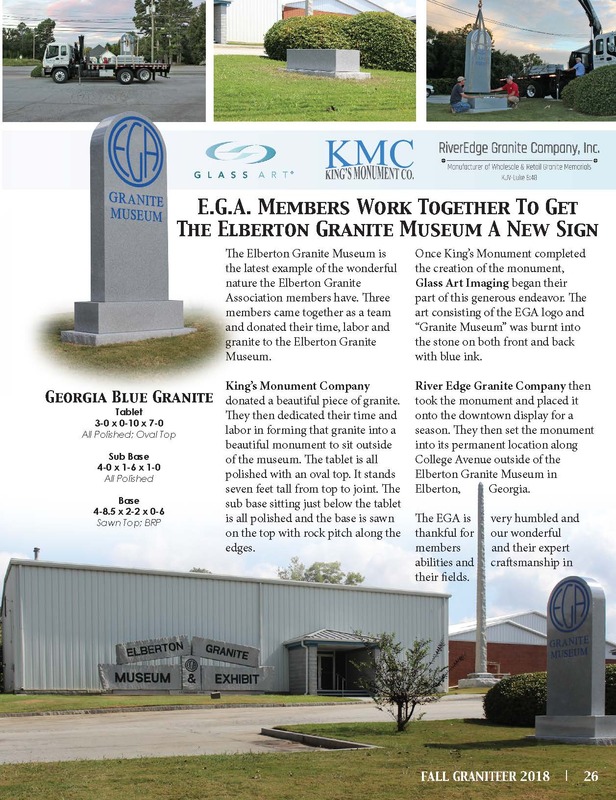 Members Work Together To Get The Elberton Granite Museum A New Sign The Elberton Granite Museum is the latest example of the wonderful nature the Elberton Granite Association members have. Three members came together as a team and donated their time, labor and granite to the Elberton Granite Museum. King’s Monument Company donated a beautiful piece of granite. They then dedicated their time and labor in forming that granite into a beautiful monument to sit outside of the museum. The tablet is all polished with an oval top. It stands seven feet tall from top to joint. The sub base sitting just below the tablet is all polished and the base is sawn on the top with rock pitch along the edges. Once King’s Monument completed the creation of the monument, Glass Art Imaging began their part of this generous endeavor. The art consisting of the EGA logo and “Granite Museum” was burnt into the stone on both front and back with blue ink. River Edge Granite Company then took the monument and placed it onto the downtown display for a season. They then set the monument into its permanent location along College Avenue outside of the Elberton Granite Museum in Elberton, Georgia. The EGA is very humbled and thankful for our wonderful members and their expert abilities and craftsmanship in their fields. 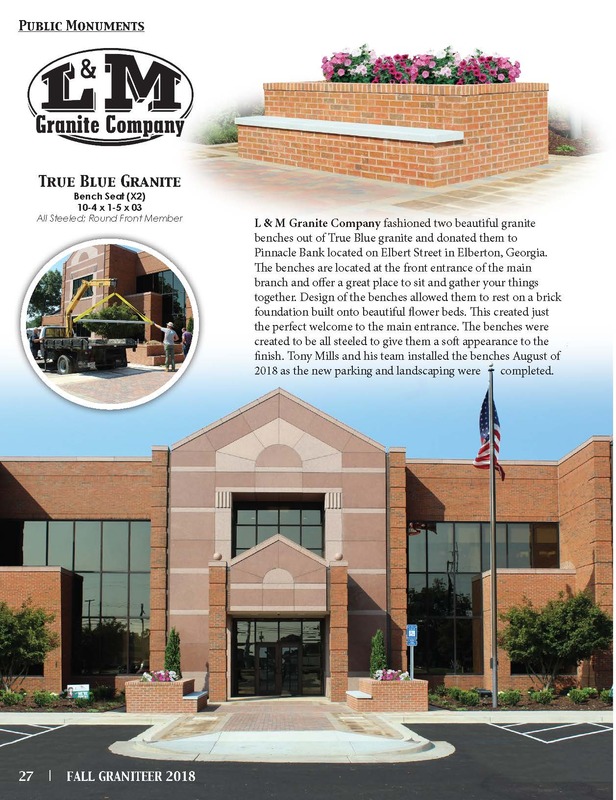 L & M Granite Company fashioned two beautiful granite benches out of True Blue granite and donated them to Pinnacle Bank located on Elbert Street in Elberton, Georgia. The benches are located at the front entrance of the main branch and offer a great place to sit and gather your things together. Design of the benches allowed them to rest on a brick foundation built onto beautiful flower beds. This created just the perfect welcome to the main entrance. The benches were created to be all steeled to give them a soft appearance to the finish. Tony Mills and his team installed the benches August of 2018 as the new parking and landscaping were completed. 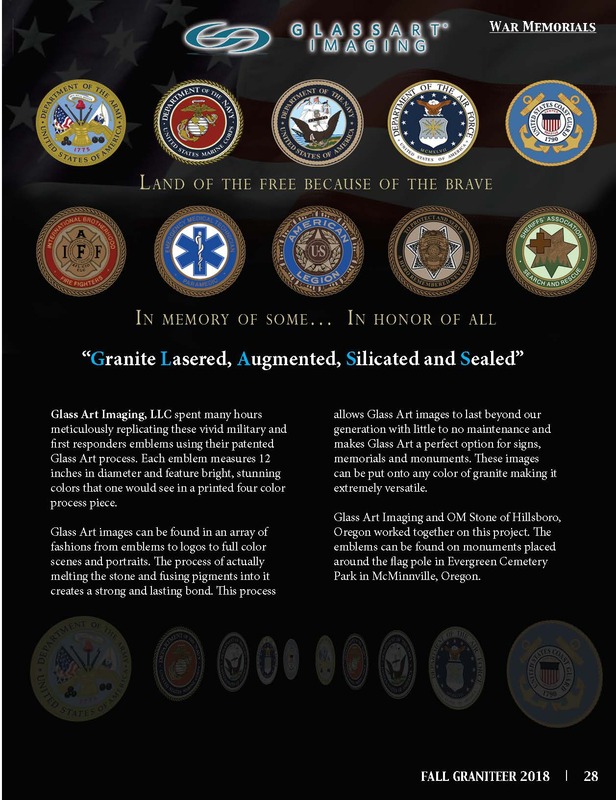 Glass Art Imaging, LLC spent many hours meticulously replicating these vivid military and first responders emblems using their patented Glass Art process. Each emblem measures 12 inches in diameter and feature bright, stunning colors that one would see in a printed four color process piece. Glass Art images can be found in an array of fashions from emblems to logos to full color scenes and portraits. The process of actually melting the stone and fusing pigments into it creates a strong and lasting bond. This process allows Glass Art images to last beyond our generation with little to no maintenance and makes Glass Art a perfect option for signs, memorials and monuments. These images can be put onto any color of granite making it extremely versatile. Glass Art Imaging and OM Stone of Hillsboro, Oregon worked together on this project. The emblems can be found on monuments placed around the flag pole in Evergreen Cemetery Park in McMinnville, Oregon. The breathtaking monument was another joint effort between members of our Association. The beautiful monument and bench were created by Welch’s Granite Company and Jenson Etching etched both front and back of the monument. The monument was then sent to Blue Ridge Monument, Inc. in Salem, Virginia. The memorial was created in honor of Sgt. Michael V. Lalush, of the United States Marine Corps. Sgt. Lalush was 23 years old and the first casualty of Operation Iraqi Freedom from western Virginia. Sgt. Lalush proudly served his country from 1997 - 2003 when his Huey Helicopter crashed on March 30, 2003 in southern Iraq. He is buried in Arlington Cemetery and was awarded the Purple Heart. This monument and bench is located at the VA Medical Center in Salem, Virginia. American Black granite was used for the creation of this memorial. On the front of the bench pedestal is the sandblasted name and dates for Sgt. Lalush. The base and seat of the bench are sawn. The pedestal is polished on the front and back while the tapered sides are steeled. The base of the monument has a polished top with all four sides sawn. The monument is polished on all four sides showing the beauty of American Black granite with the veins running at an angle across the face. The front of the monument is etched with the ceremonial hand off of the flag while the back is etched with the commemorative Fallen Soldier Battlefield Cross. Majestic Granite Company created this monument for O.T. Davis Monument Company from Gainesville, Florida. The monument is located inside Kanapaha Park. The monument was created to honor military and police K-9s that serve every day to assist and protect their handlers. K-9 Veterans Memorial Foundation, Inc. noticed a lack of recognition for four legged soldiers and officers when visiting the Kanapaha Veterans Memorial Park in Gainesville, Florida. They decided to enlist the help of sponsors and groups to get these very special service dogs their own tribute. Once funds were raised, the monument was placed on order. MWD Jukon (retired K-9) was used as a model to create the statue sitting atop the granite. The memorial was set and dedicated May of 2014. 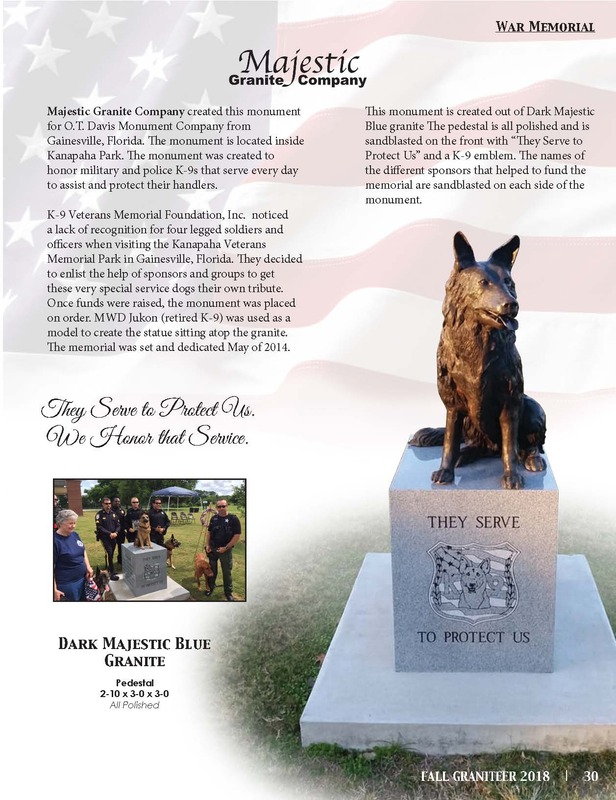 This monument is created out of Dark Majestic Blue granite The pedestal is all polished and is sandblasted on the front with “They Serve to Protect Us” and a K-9 emblem. The names of the different sponsors that helped to fund the memorial are sandblasted on each side of the monument.